The estuaries of the U.S. Pacific Coast are diverse and productive ecosystems of high ecological, cultural, and economic value. They have many stakeholders, are managed to meet many different, often competing, objectives, and contend with environmental stressors from a variety of sources. Ocean acidification (OA) is one stressor expected to have widespread impacts on the Pacific coastal ecosystems. Recently, the West Coast Ocean Acidification & Hypoxia Science Panel recommended improved monitoring to assess biological impacts in the coastal ocean and estuaries. 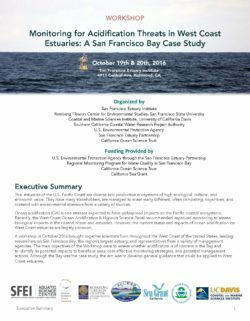 However, the current status and impacts of ocean acidification on West Coast estuaries are largely unknown.